Where kids can be themselves! PLEASE REGISTER BY JUNE 4! Discovery Camp is back! This time with full days! Extended care available until 5pm for $5/day. Expenses are shared by the Fellowship and families. We have both volunteer and paid staff to keep costs low to each family. Discounts are available for families with multiple children. No child should be unable to participate due to finances. (Message Heather Cleland-Host for more information – this will be held in strict confidentiality). THEME: We will be having four days of fun journeying from “port” to “port” on a grand adventure of self-discovery and community building, learning more about who we each are and what is important to ourselves and our community. We will start on the first day preparing for our journey and putting together our crew (team building). Subsequent days will be spent exploring various “ports” – like Port Legend or Port Courage. We will have fun activities like: building ships for our journey, creating traveling clothes (tie dye shirts), swabbing the decks (water fun), escaping from the Isle of Deception (Solving Puzzles), creative Expression through drama, drumming, & art, and plenty more! 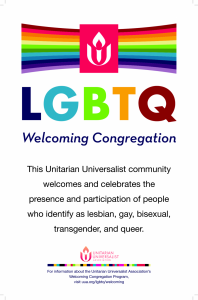 NOTE: PLEASE REGISTER BY EMAILING DREHEATHER@UUFOM.ORG ASAP. We will not be holding the camp if we do not have at least 12 campers by June 4! Previous PostFrom the Board PresidentNext PostCovenant Groups are Opening Soon!